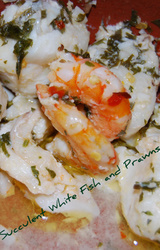 This Mediterranean fish casserole recipe is healthy, absolutely delicious and a breeze to make. All you have to do is put all of the ingredients together in an oven proof casserole and bake. Ideal as a stress free dinner party dish.....and it looks and smells amazing when you bring it to the table and take off its cover. It makes it's own tasty sauce while it cooks! We usually serve it with our brown rice recipe and a fresh green vegetable or a crisp dressed salad. 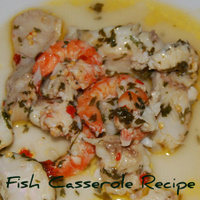 This recipe can really be used for any fish fillets.....we have made it with sole, cod, snapper, tilapia, and many more. If you don't like prawns or shrimp, substitute them for any of these fish. Lay the hake fillets in the base of an oven proof casserole dish. Top evenly with the prawns/shrimps. Mix the garlic with the lemon juice and zest and pour evenly over the fish. Sprinkle over the parsley and chilli. Next drizzle over the olive oil. Finally season to taste with salt and black pepper. Cover the casserole with a double sheet of aluminium foil and seal really well. This stops the loss of liquid/steam during the cooking process. Place in a very hot oven 230ºc/450ºf for 20-25 minutes. Remove from oven and allow to rest, still covered, for 5 minutes before serving. Bring to the table and uncover in all it's glory - the aroma's are absolutely gorgeous. Serve immediately with extra lemon wedges if desired.